Tai Chi is an ancient healing/martial art that works by harnessing a person’s life force, spiritual focus and mental stamina. It combines graceful movements with internal energy (Chi/Qi) cultivation, conscious breathwork, and dynamic, spiraliform stretching techniques. The foundation of Tai Chi training is integration of mind, Chi/Qi, and body, gradually increasing flow of internal secretions and inner vitality. When practiced regularly, Tai Chi promotes rejuvenation even at the cellular level. It slows down the aging process and counteracts decline of the physical body and the brain. The Yang style Tai Chi classes (forms and applications) are taught by master teacher Dr. Nicholas Corrin, OMD (Doctor of Oriental Medicine). 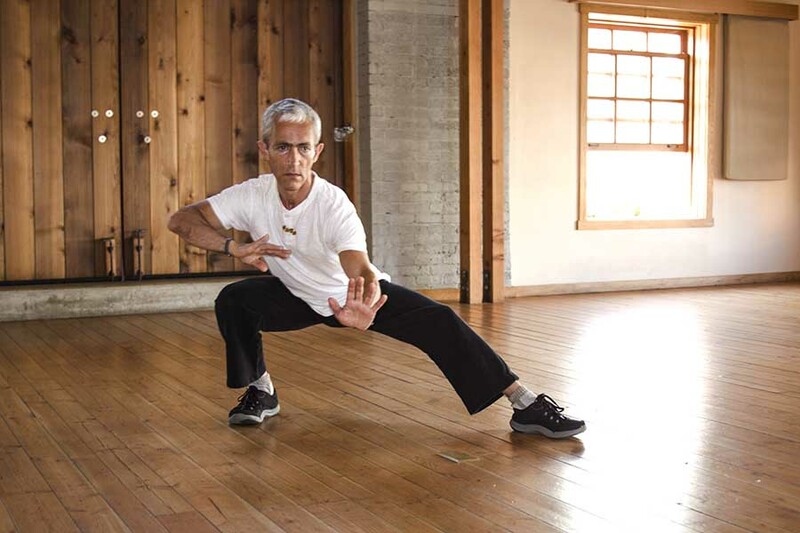 The principles of Tai Chi and Qigong have been the guiding force of his 20 years of successful clinical experience. 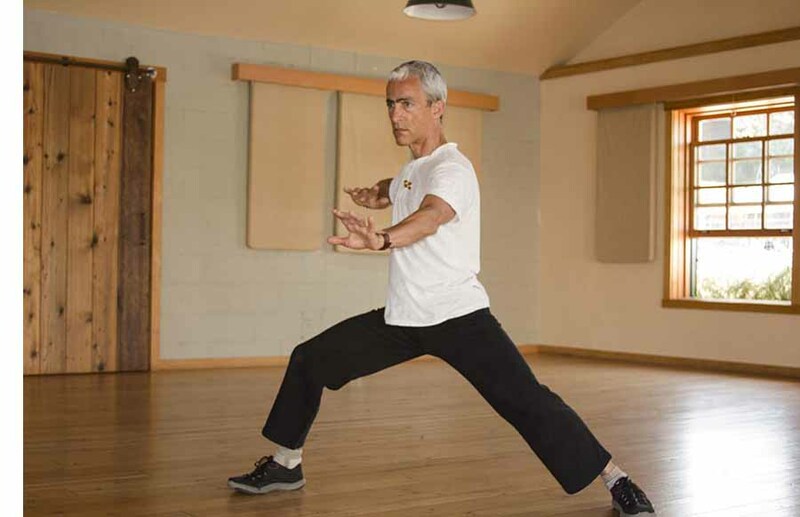 His nationally patented Vibrational Medicine techniques and their astonishing distant healing effects are the result of his life-long dedication to mastering (and teaching) these amazing subtle arts (Qigong and Tai Chi). The classes are highly disciplined yet always light-hearted, and filled with humor as well as a wealth of information on health issues and preventive medicine. There is, in equal measure, an emphasis on modern scientific research, classical philosophy, humanist culture, and ecology. This class is a gem for self-motivated individuals who wish to be empowered to take charge of their well-being on multiple levels. With regular practice, you will become light, fluid, calm and confident. Consistent practice will reward you with quiet power and graceful suppleness. Tai Chi is a gentle, flowing exercise which offers many health benefits, especially for older people who have joint and circulation problems. But Tai Chi is more. Its real name is Taijiquan. Tai means “great”, ji means “ultimate” and quan means “fist”. So Tai Chi (or Tai Ji) is really an ancient, sophisticated system of self-defense. The person develops great capacities by gradually learning to tap into cosmic energies instead of resisting them. This internal receptivity (or softness), results in the production of internal power. This internal energy cultivation makes the body more vital and youthful. It makes all parts of us pliant, responsive, connected and spontaneous. It allows the body – and mind – to adapt to suddenly changing circumstances without undue stress, and without us seizing up into rigid fight-or-flight reactions or holding patterns. Practicing Tai Chi for health brings great rewards, even for a beginner, and even if the student is not performing the forms quite correctly! Tai Chi is safe to practice at any age. Unlike with other sports/exercise systems, with Tai Chi and Qi Gong, a person can actually becomes stronger as they grow older. This is because the mind, through practice, grows so clear that it can infuse the body with its clarity, thus revitalizing it. This elegant but simple formula accounts for how healthy (or not) we are. Optimal circulation of our blood, lymph, glandular secretions and emotions alongside a sense of inner calmness and tranquility determine how healthy we are, and even how long we may live. These two factors also determine our possibilities of happiness and success. The concept of Fluid Body, Grounded Mind® also developed independently out of my patented, futuristic medical modality, Vibropuncture®. By using highly precise, non-local input signals into the patient’s body, even through a computer webcam, amazing therapeutic benefits can be generated. We have seen nothing but exciting and extraordinary results all over the world with this new technique. But it is not simply the presence of good circulation and calmness of mind that determines the quality of our health. It is how these two components interact. 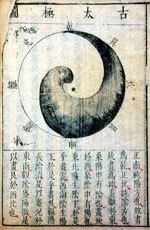 For they must not be seen as separate components, they are entirely complementary and reciprocal. In fact, good circulation (communication) and calmness (tolerance/patience) are also the basis for any healthy relationship, whether between individuals, groups of people, or even nation states. It is also well known that all excellence, whether in sports, the performing arts or, indeed, any discipline whatsoever, relies on the optimal combination of fluid movement (circulation) and mental focus (calmness). “Being in the zone” means what exactly? It means optimal, unblocked, circulation of energy, blood flow, and inner power, and it means, at the same time, to feel completely grounded, centered and free of delusions and mental chatter. Here, at the center of the outer octagon known as the Ba Gua, we find the circular Tai Chi symbol, with its interrelated swirls of black and white. Notice that within the black swirl is a white dot, and within the white swirl is a black dot. The sinuous interface (look at the curved line between the white and black areas) looks very much like the shape of the human spine, with the natural curvature exaggerated. This sinuous “midline”, evoking that part of the central nervous system embedded in the spine, is the exact location where true integration occurs. That is to say, the place from where a fluid body and a grounded mind can be generated. It is the very basis of energetic understanding, excellence and self mastery. And it accounts, not just for the possibility of optimal health, but also for the development of internal spiritual development. It is when we expand the essential formula including its mirror image that we get the closest to genuine truth, power, health and expansion of consciousness. We then arrive at a specific, logical sequence, capable of re-generating coherence in our bodies and kinds, which have become “scrambled” by incoherent signals derived from all sorts of sources, from physical to emotional: sources such as toxins, infections, postural impediments, even our subconscious feelings and delusional holding patterns. The precise sequence you see here Grounded Body, Fluid Mind/Fluid Body, Grounded Mind™ is the very basis of our revolutionary system for health and self development, which we have called the Infinite Body System™. This system has taken us decades of research and development, and is anchored in the ideas laid out in The Power of Letting Go, our multiple award winning publication. Learning the entire system itself requires a 12 step program of workshops, study and practice. Stay tuned, as we are now making ready to launch these workshops very soon!